In the US South, the distribution of forest ownership can be broken down into two categories, public and private. Public lands in the South are owned by federal, state and local governments; they make up 12 percent of the timberland—just over 29 million acres. Private lands are owned by corporations, financial institutions and private individuals with small tracts; they own 88 percent of timberland in the South—nearly 222 million. 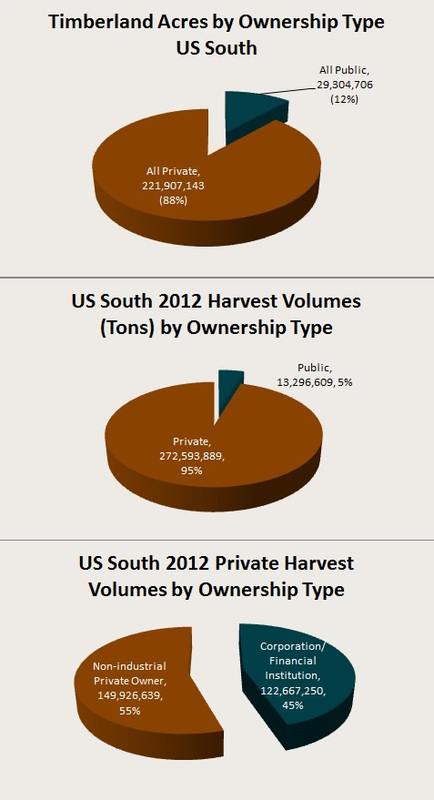 While there is an 88 percent/12 percent distribution of timberland acres between private and public ownership, the distribution of harvest volumes demonstrates that more timber is harvested from private lands than from public ones. Ninety-five percent of the volume is harvested from privately owned lands—more than 272 million tons, and just 5 percent—just over 13 million tons—is harvested from public lands. If we break the harvest volumes out by type of private ownership, we see that corporations and financial organizations account for 45 percent of the harvest, or more than 122 million tons, and that non-industrial owners of smaller timber tracts account for 55 percent, or nearly 150 million tons. A model in which wood moves directly from the forest to a conversion facility. This model is typically referred to as Woods Direct. A model in which wood moves from the forest to concentration yards or intermediate processing facilities before being transported to a conversion facility. For clarity, we refer to this model as a Network model.